Getting around in Dino Master: Dig, Discover, Duel (henceforth shortened to Dino Master) is simple enough. The opening credits are a little long and unskipable, though. Also, the demo transmission is under "Options" and then "Give Data" (somewhere newer and younger players - the prime demographic? - may not know to look). The menus are otherwise fine. The options are large enough, the labels are large and clear. Even the buffer space is good. The menus move around a bit, but the center part of each line is always tapable for a given option. Controls in Fossil Hunt are a little bit sketchy when it comes to "dragging" the archeologist or his truck around. They always seem to be a little behind the stylus. The camera (viewpoint) also cannot be controlled separately, meaning it's often not where it's wanted. In Dino Battle... well... it's just tapping and guessing. The tapping works OK.
Dino Master's content is lacking. There are two donwloadable demos (no multiplayer (even mini games). There are no options like difficulty levels or choice of dinos. While the graphics are great for the dinosaur recreations in Dino Battle, there is no animation (the graphics in Fossil Hunt are alright). There's nothing wrong with the sound, but it does harken back to late '80s/early '90s arcade games. Change "Mulitplayer" to "Connectivity" and move the demos there. Permit the player to move the "camera" around separately from the archeologist. Improve the "drag speed" of the archeologist and his truck. Include some player-selected options (difficulty level, dino selection, etc.). Offer a description of what would follow in the main game after each playthrough of Fossil Hunt. 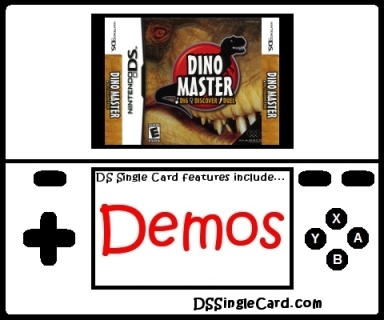 Click here to return to the DSSingleCard.com Dino Master: Dig, Discover, Duel profile.